Our selection of bespoke womens products include bags, purses and scarves ideal for that special lady. Women There are 9 products. 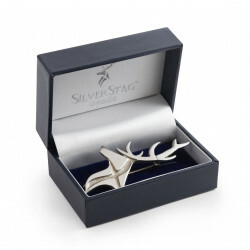 With brooches enjoying a fashion renaissance at the moment, this elegant piece made from pewter is the ideal gift for ladies of all ages. 220mm across x 260mm depth. Adjustable nylon strap. 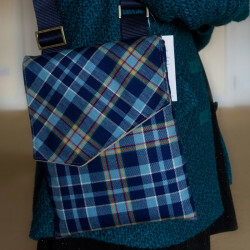 The perfect size for all your small change, this pretty purse is made from our bespoke STAND tartan and fully lined for durability. 140mm x 100mm zipped. 1600mm x 250mm. 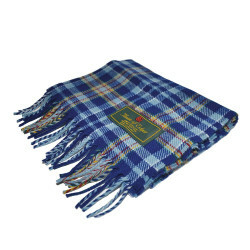 Manufactured by the House of Edgar in Perth. 100% New Wool. Rare black fresh water pearls and delicate diamantee are the key features of this exquisite one-size-fits-all bracelet. 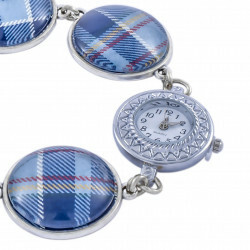 Our unique STAND tartan droplet finishes it beautifully. Timeless fresh water pearls and delicate diamantee are the key features of this exquisite one-size-fits-all bracelet. Our unique STAND tartan droplet finishes it beautifully. 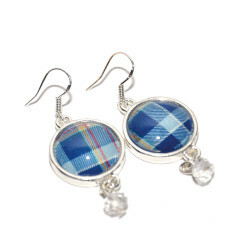 These pretty drop earrings are hinged from sterling silver with our bespoke STAND tartan droplets and crystal beads.